Free Download SolveigMM Video Splitter 6.1.1707.6 - Fast and powerful video splitter & joiner. SolveigMM Video Splitter is a fast and powerful video editor. It was developed to split and join files in various formats including MP4, MOV, AVCHD, AVC/H264, MPEG-2, MPEG-1, MKV, AVI, WMV, MP3, WMA without quality loss. The video editing tool is based on SolveigMM Video Editing software development kit and offers outstanding quality and speed without encoding/decoding operations. This video splitter allows k-frame accuracy for precision splitting for AVI file format and frame accuracy for MPEG-2 / MPEG-1, ASF, WMV, MP4, MOV, MKV, AVCHD. 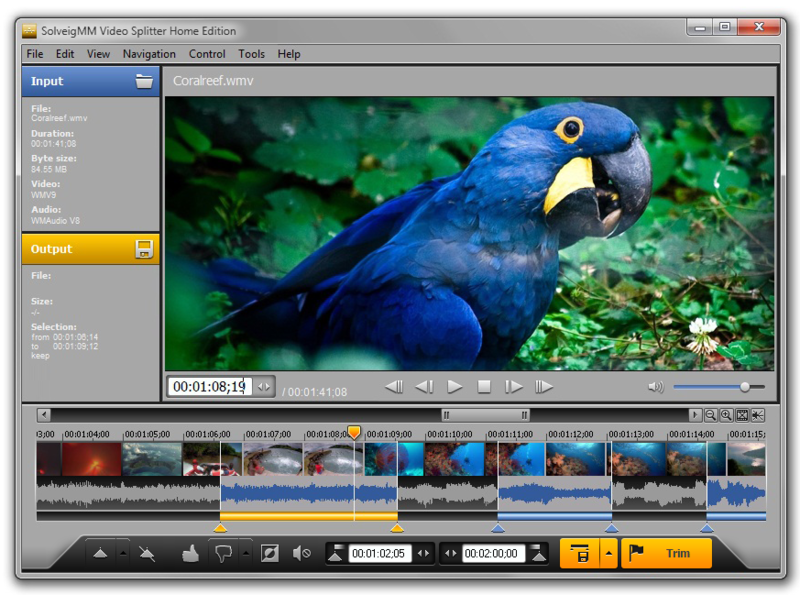 The stylish and intuitive interface helps any user to split, trim or cut a video in just a few mouse clicks. The preview window is designed for easy navigation through media files and allows you putting splitting markers as precisely as possible. For fast zooming you can move the cursor to the story board and rotate the mouse wheel. The SolveigMM Video Splitter allows you to cut out multiple fragments of a video by setting markers and have the remaining parts merged together in the Join Manager. All files must have the same parameters, such as video frame height/width, audio/video compression type, etc. to be joined successfully, as re-encoding is not supported during the joining process. The video preview window will also help you mark multiple sections per video clip and remove unwanted fragments (for example, remove commercials) from your video files in one session. In the Batch manager you can process all of your editing tasks together without you sitting in front of the computer. - the command line mode support.